NOTE: 1 oz. of product treats up to 16 gal. For shipping outside of the Continental United States, request a quote by contacting us at (828) 468-4895 or email for prices. NOTE: 55 Gallon Drum must ship LTL so please contact us for a shipping quote OR pick up locally. For volume and/or testing discounts please call (828) 468-4895 or email for a quote. TK7-704HS for diesel engines is a multi-benefit, multi-function formula for light and heavy duty and fuel-oil engines. Cold Flow improver – Prevents gelling of diesel in the fuel lines. This product raises cetane power levels, cleans and maintains the entire fuel system, and has an active biocide (fungicide). TK7 fuel technology produces abundant, upper cylinder lubricant replacing sulfur as the lubricant for injectors and injector pumps. Along with its many other benefits TK7 eliminates valve wear by 360% and bore wear by 600%, while virtually eliminating valve recession. TK7 Diesel Fuel Formula increases 43.6 cetane diesel to 45.3 cetane diesel, therefore, producing more horsepower. TK7 Diesel Fuel Formula contains components which improve engine ignition, therefore reducing fuel consumption. The BTU of the fuel is also raised, resulting in more consistent and complete combustion. The product contains a high detergent, non-alcohol fuel injector cleaner of the safest quality that will dissolve carbon buildup, wax, and crystalline problems found in fuel systems. TK7 keeps fuel systems free of bacteria, fungus, and yeast contamination through the use of a biocide (fungicide) resulting in trouble free operation of equipments. This attribute is of very high value to corporate and strategic (military) diesel storage facilities and vehicles. The combination of an upper cylinder lubricant and added power yields increased fuel mileage while reducing fuel and maintenance costs. Smoke opacity is reduced by an average of 50%. As a result of using TK7 fuel technology, hydro carbons (HC), carbon monoxide (CO), oxides of nitrogen (NOx) and particulate matters (PM) are reduced. This reduction is due to an increase in complete combustion and perfect seal of the valves. On average oxides of nitrogen are reduced by 20%. Our product effectively treats water trapped in the bottom of fuel tanks through the use of a unique compound. This compound combines water with fuel and, as a result, water is burned up by the engine. This TK7 fuel technology efficiently reduces water caught in the separator by up to 5% (by volume). Fuel Stabilization: TK7 Diesel Fuel Formula promotes molecular balances (keeps fuel from separating) resulting in a much greater and consistent flame travel in the combustion chamber. Metal Affinity Compound: This technology prevents fuel tanks, in power units and storage tanks, from becoming corroded. This is due to a metal compounded in the TK7 Diesel Fuel Formula which prevents corrosion caused by excess water in the tank. This compound also has a special affinity for copper and aluminum, however, also protects all metals. Safe for Seals and Fuel System Components: Most fuel additives contain common formulations that attack Buna-N, neoprene, nylon, and rubber. 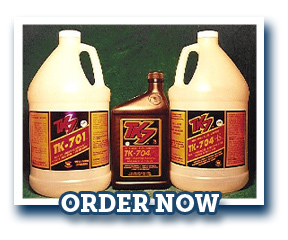 TK7 formulations will not dry out, swell or attack any fuel system component. TK7 does NOT Contain Petroleum Distillates: Many additives, present on the market, have not changed their technology in the last 70 years. This outdated approach utilizes naphthalene, kerosene, ethyl-benzene, oxylnitrate, ethylene or propylene glycol, nitric acid, vinyl acetate, and sinterable metal compounds. These compounds, at best, are non-functional and, at worst, cause premature failure of various components contaminating the oil. However, TK7 Diesel Fuel Formula utilizes the most advanced technology available on the market to date. Bottle – 5oz., Easy Fill Bottle – 16oz., Quart – 32oz., Gallon – 128oz., 55 Gallon Drum – 7,040oz.